With Christmas stuff in stores and Halloween rapidly approaching, you know that November is almost here. 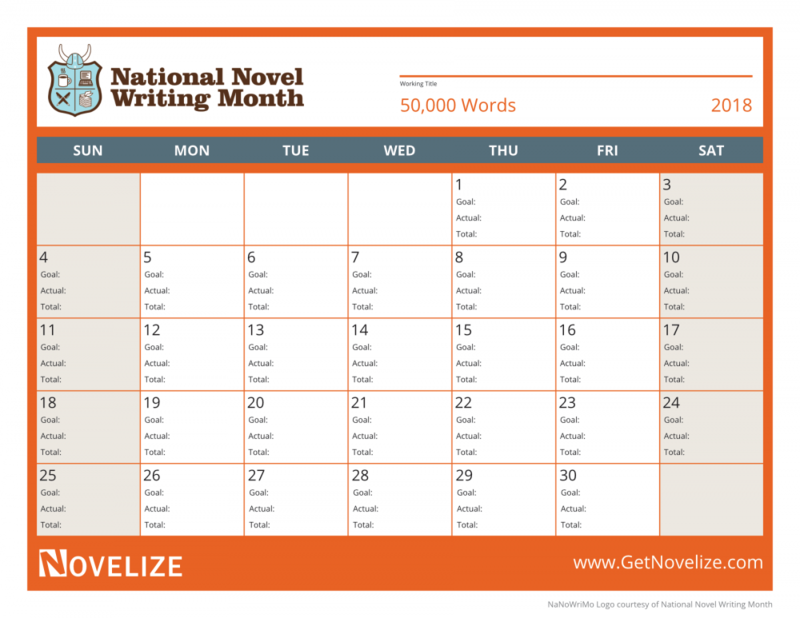 If you’re a writer, you’ve probably heard of National Novel Writing Month, short NaNoWriMo. During NaNoWriMo, writers commit to writing 50,000 words in one month. At first glance, this sounds a bit steep, but here are 5 reasons you should give it a try. If you want to write a novel but haven’t made it happen yet, it’s time to give NaNoWriMo a try. Using NaNo to jumpstart your writing is like a New Year’s Resolution on steroids. Instead of trying to write a novel in a year, you get it done in a month. Even if you fail, you’ll probably make more progress than if you spaced out your word count to write a novel over the year. Additionally, you can really get this novel done by the end of 2018 working at this speed. If you’re reading this article, you’re guilty of procrastination. It happens to all of us – so don’t feel bad. Life gets busy for everyone. Work, kids, school, second job, family, emergencies, medical issues – there are millions of reasons not to write today. But there is at least one reason to do it anyway: you want to get your novel written. So sign up for NaNo and stop procrastinating. Most authors have a thank-you page in every one of their books. Many authors need several pages to thank their support team. Everyone needs support in their chosen profession. When you decide to pursue novel writing as more than a little side hobby, your family must be on board. NaNoWriMo offers some of that support for you in the form of a community. You can ask questions, compare notes, and share your experiences with others. You can sign up through the community before November, too, which can help you prep. If you’re not a writer, you can’t understand the struggles with writing. That’s one reason why many authors join writers’ groups or sign up for writing retreats. It’s nice to have people who share your dreams and goals. They can pull you up and help you reach your goals. Finishing the first draft is a big step in the process of publishing a book, but it’s still a daunting task. If you prefer some other type of recognition, NaNoWriMo is a great choice for you. You can earn plenty of writing badges along the way which is very encouraging for making progress on your novel. They break down your goals in a way that encourages you to keep going. To win, you just have to upload your words into their word count validation tracker after November 20th. National Novel Writing Month is a 501(c)(3) non-profit organization that believes your story matters. They have sponsors and they accept donations to further their cause. Participation in NaNoWriMo is absolutely free for everyone. Anyone who has ever thought about writing a novel can (and possibly should) sign up. Here is how NaNoWriMo works, and here is where you can sign up to get started. Please note that you can’t write your novel inside of NaNoWriMo. It’s only used to validate your word count and present you with progress awards. So you can write inside of Novelize as usual and copy the words over when you’re ready to claim your rewards. Novelize is not affiliated with NaNoWriMo in any way, although we wholeheartedly believe in their cause.